Is éan é an Cíobhaí atá le fáil sa Nua-Shéalainn, agus baint aige leis na Apterygidae. Níl cumas eitilte aige. Tugtar aitheantas do chúig spéiceas agus iad go léir i mbaol. Is é an dífhoraoisiú is mó a rinne díobháil dóibh, ach tá cuid mhaith dá ngnáthóg le fáil i limistéir chaomhnaithe anois. Tá siad i gcontúirt fós de bharr theacht na gcreachadóirí mamacha. Tá cúig spéiceas aitheanta ann (agus ceithre fhospéiceas ag ceann acu), agus spéiceas eile nár tugadh cuntas foirmiúil fós air. Is é an spéiceas is toirtiúla an Cíobhaí Mór Breac nó Roroa (Apteryx haastii). Tá sé timpeall 45 cm ar airde agus tá meáchan timpeall 3.3 cg ann. (Tá meáchan timpeall 2.4 cg sna héin fhireanna.) Tá clúmh liathdhonn ar an spéiceas seo agus stríoca i leith na báine ann. Beirtear aon ubh amháin agus gorann an dá thuismitheoir í. Meastar go bhfuil os cionn 20,000 éan den spéiceas seo ann agus iad spréite faoi shléibhte iarthuaisceart Nelson, faoin gcuid thuaidh den Chósta Thiar agus faoi Alpa an Deiscirt. Rinne muca, cait agus easóga (ainmhithe a thug na coilínigh isteach leo) slad ar an gCíobhaí Beag Breac (Apteryx owenii), éan gan toirt. Díothaíodh ar an mór-roinn é ach tá timpeall 1,350 ceann den spéiceas ar Oileán Kapiti agus tugadh isteach in oileáin shábháilte eile é. Dealraíonn sé go bhfuil sé ag pórú ann. Níl sé ach 25 cm ar airde agus tá meáchan 1.3 cg san éan baineann. Beirtear aon ubh amháin agus gorann an t-éan fireann í. * Aithníodh an Rowi (Cíobhaí Donn Okarito nó Apteryx rowi) mar spéiceas nua sa bhliain 1994. Tá imir liath sa chlúmh agus uaireanta tá cleití bána ar an ngrua. Is féidir leis na héin bhaineanna trí ubh féin a bhreith i séasúr amháin, agus gach ceann acu i nead difriúil. Déanann an dá thuismitheoir na huibheacha a ghoradh. Níl an t-éan seo le fáil anois ach i limistéar beag ar chósta thiar an Oileáin Theas. Is léir ón DNA is sine, áfach, go raibh sé spréite níos forleithne fadó, agus nach raibh aon chíobhaí eile le fáil i ndeisceart an Oileáin Thuaidh. Tokoeka Oileáin Stewart (Apteryx australis lawryi). Tokoeka na gCaolsáilí Thuaidh (Apteryx australis ?) agus Tokoeka na gCaolsáilí Theas (Apteryx australis ?) in iardheisceart an Oileáin Theas. Tokoeka Haast (Apteryx australis ? ), an fospéiceas is teirce agus gan ann ach timpeall 300 éan. Tugadh aitheantas dó sa bhliain 1993. Le fáil i limistéar cúng iargúlta i Sléibhte Haast san Oileán Theas. Gob air atá níos cuaire ná mar is gnách, agus clúmh sách rua air. Cíobhaí Donn an Oileáin Thuaidh (Apteryx mantelli nó Apteryx australis roimh 2000). É coitianta i dTuaisceart an Oileáin Thuaidh. Timpeall 35,000 éan ann. Na héin bhaineanna timpeall 40 cm ar airde agus meáchan timpeall 2.8 cg iontu. Meáchan timpeall 2.2 cg sna héin fhireanna. Éan seiftiúil é a thaithíonn a lán gnáthóg, go fiú áiteanna ar fhág daoine a rian orthu. Clúmh biorach rua air. Dhá ubh de ghnáth agus iad á ngoradh ag an éan fireann. http://www.taxonomy.nl/Main/Classification/51305.htm Systema Naturae 2000 / Classification, Family Apterygidae. Brands, Sheila. The Taxonomicon. Cooper, Alan et al. (2001). "Complete mitochondrial genome sequences of two extinct moas clarify ratite evolution." Nature, 409: 704-707. 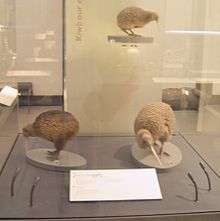 Davies, S.J.J.F., eagarthóir, Hutchins, Michael, Grzimek's Animal Life Encyclopedia, 'Kiwis,' eagrán 2 (2003), Gale Group: imleabhar 8, 'Birds I Tinamous and Ratites to Hoatzins,' Farmington Hills, MI. ISBN 0-7876-5784-0. Lgh 89–90. "Shy envoys off on their OE," Eloise Gibson, New Zealand Herald, 29/04/2010. "Latin Names Explained. A Guide to the Scientific Classifications of Reptiles, Birds & Mammals" (1995). London: Facts on File. San Diego Zoo, Kiwi http://www.sandiegozoo.org/animalbytes/t-kiwi.html Birds: Kiwi. San Diego Zoo. Tugadh an leathanach seo cothrom le dáta an 22 Bealtaine 2016 ag 19:51.